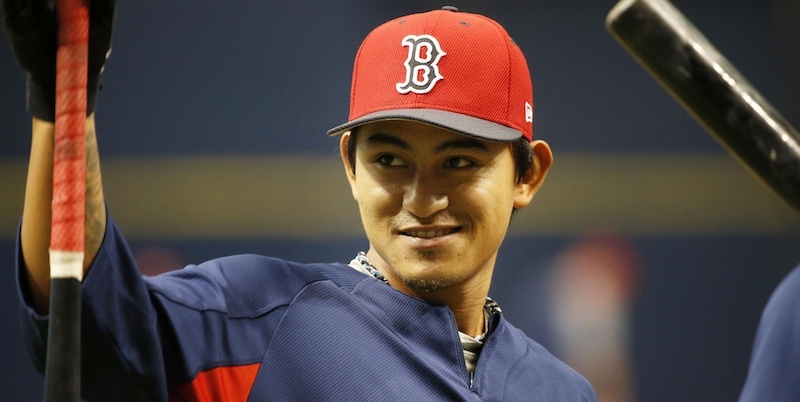 At the beginning of the year, Tzu-Wei Lin as regarded as a light-hitting infielder who struggled to hit but could play a few positions acceptably, which was seen as fairly disappointing for a guy who had a two-million-dollar signing bonus coming out of Taiwan. He had registered over 500 plate appearances as a Sea Dog with very little to show for it. Sure, he was only 23, and still had a few years to go until any chance of a wash out came up, but it wasn’t terribly promising. Then everything changed. His approach and hitting profile improved dramatically, and thanks to a shortage of good third basemen, Lin soon found himself in the major leagues. For the few weeks he was on the team, he did fairly well. Wasn’t amazing, wasn’t terrible, but for a guy who had zero Triple-A plate appearances in his professional career by the time of his initial call-up, I’d say he did just fine. As a prospect, however, he blew past any and all expectations. Jeff Paternostro saw something in him over a year ago on the Top 10 Prospects list($), and he noted his weakness for a good glove with a semblance of offensive tools, even if Lin continued to toil away at Double-A. Then he started making noise, and eventually got a spot on Carson Cistulli’s Fringe Five series in mid-May, after Lin had 1. reduced his groundball rate by over 20 percent, 2. had recorded an Isolated Power mark more than triple his career number, and 3. brought his strikeout rate down to 18.5 percent — below the Eastern League average. As another month went by, Lin got even more attention. He got another blurb on the Fringe Five, and a few days before his call-up, Erich Rothmann praised his growth over at the main site($). So, yes, he got some attention. That is a good thing. But why? Well, Eric Longenhagen observed several improvements to his stance and swing. He started using his lower body more in his swing — better footwork helps a lot here — and thanks to his good hand-eye coordination and contact skills, he’s been able to quickly add more power to it. Is he going to hit a ton of homers? Probably not. But I’m a sucker for middle infielders who can make contact like he does, especially when he can turn those long singles into doubles with his plus speed. Lin finally found his stroke. That swing and hit is emblematic of everything he’s done this year. The leg kick gets down to lock in the power, he turns on a middle-in fastball, and gives it enough loft to send it nearly 380 feet to right. Lin’s tenure with the club was one of the high points of the season, and it was all because everything went right. Lin was eventually sent down on July 16th, after the Red Sox deemed Brock Holt healthy enough to play. His offensive explosion was toned down a bit as he had more time to face more advanced pitching — the walk and strikeout rates regressed, the grounders came back, and there were a lot of pop-ups. I don’t think any of us were expecting his .385 BABIP in the majors to hold up, even with his encouraging batted ball profile, so this was just natural regression. He still made good contact and whiffed only five percent of the time in Pawtucket. Other than that, nothing was really all that terrible. Despite being buried on the depth chart by Holt, Marco Hernandez, Deven Marrero, and possibly the addition of another utility infielder (Eduardo Nunez, anyone? ), Lin is closer to the majors than people realize. That’s a strange statement to make about a guy who has already been there, but with Hernandez’s shoulder, Holt’s general ineffectiveness, and Marrero’s allergy to any kind of offense, Lin is only an injury and a bad slump away from a roster spot. He’s still on the fringes of the 25-man at best right now, but it shouldn’t surprise you if we see him get a handful of plate appearances come mid-season, especially if he lights it up at Pawtucket. The Red Sox just might have something here.